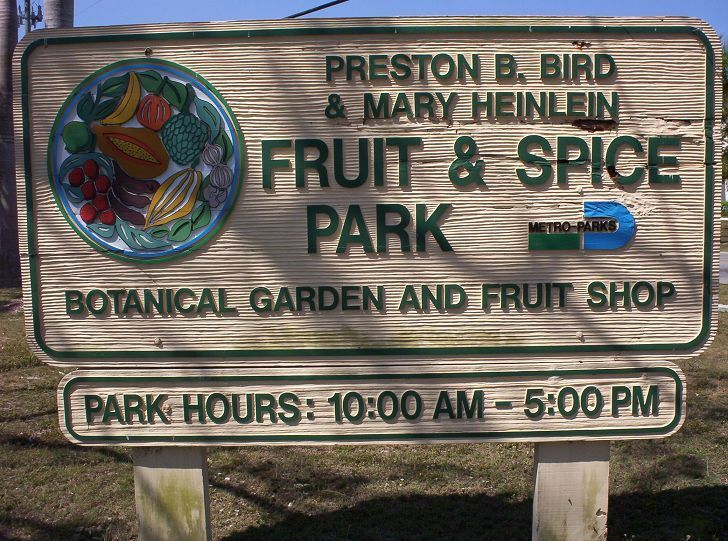 The Fruit and Spice Park is located in Homestead Florida. The following photos of the grounds where taken on a trip in early May 2006. They have a nice gift shop and a great collection of plants. Entry into the Fruit and Spice Park includes a tram tour, which is even more important because of the lack of descriptive signs on the plants. The lack of markers was really the only thing dissappointing about the park, so hopefully they will remedy this soon. The Florida Fruit and Spice Park occupies 35 acres and is operated by the Miami-Dade County Parks and Recreation Department. It was founded in 1946 and has survived several hurricanes, including Hurricane Andrew which caused extensive damage. The community surrounding the Fruit and Spice Park is also interesting because it must be one of the largest collections of plant nurseries and orchards in the country. The climate in this part of Florida is about as close as one can get to the tropics in the continental United States. Orchards of mangoes can be seen along the country roads along with fields full of thousands of potted plants. In fact, it might be a good idea to plan your trip you so can also go visit some of the local nurseries in addition to the park. The Florida Fruit and Spice Park is a must see for anyone interested in growing tropical fruiting plants.